Annie the elephant being beaten by worker at Bobby Roberts Super Circus. ADI (Animal Defenders International) has released video footage of horrendous scenes of animal abuse suffered by circus animals. Some of the most shocking footage shows an elephant named Annie repeatedly being struck with a metal pitchfork and kicked in the face and body while shackled in heavy chains. 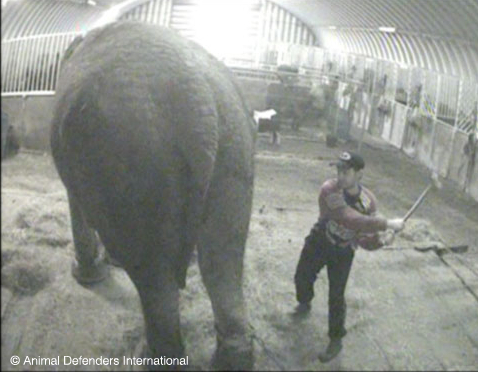 An arthritic 57-year old Asian elephant, Annie is "owned" by the Bobby Roberts Super Circus. Her violent abuse at the hands of circus workers occurred at the circus's winter quarters in Northamptonshire, England. ADI reports that Annie, who was captured as a baby in Sri Lanka in 1954, was "constantly chained" during the entire three-and-a-half week period of filming. During this time, circus workers were "also seen beating and spitting on a camel," as well as "beating miniature ponies and horses on numerous occasions." The secret filming sparked a massive public outcry in the days after it went public, and media outlets are now reporting that Annie will soon leave the circus and be rehomed at a park where she will be provided with a secure environment and proper veterinary care. "ADI has now exposed the shocking abuse of animals in UK circuses from several random undercover investigations over the last fifteen years. Only recently, in 2009, the beating of elephants at the Great British Circus was exposed and now in 2011 Bobby Roberts Super Circus shows that this is a way of life at the circus. A clear pattern has been proven and this time the government needs to act." The group is calling for a ban on the use of wild animals in circuses. For ways to help, visit the Stop Circus Suffering section on the ADI website.